The complex [HCo6(CO)15]– has a calculated bond index at the hydrogen of 0.988 and a calculated NMR chemical shift of 21.6 ppm (ωB97XD/Def2-TZVPPD calculation) compared to a measured value of 23.2 ppm. Despite being six-coordinate, the hydride has a bond index that does not exceed one (it is not hypervalent). So here is the neutral helium analogue. 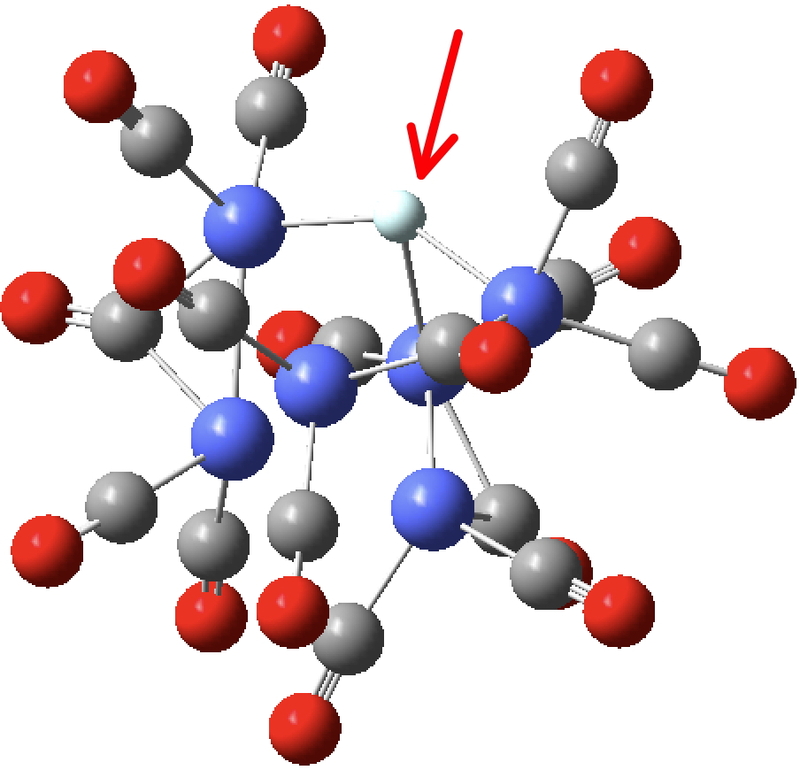 The He bond index emerges as 0.71 at the geometry of the hydride complex. Compare this with the bond index of 0.15 calculated for Na2He and it would be fair to say that at this geometry, the helium in [HeCo6(CO)15] would have a greater claim to be a molecular compound. Back in 2010, extrapolating from a series of posts here, I had speculated about other molecular species of He, including the di-cation below. This has a He bond index of 0.54, rather less than that in [HeCo6(CO)15] but much more than in Na2He. It is also vibrationally stable. But now, [HeCo6(CO)15] goes “pear-shaped” (why do pears have such a bad press?). I started a process of optimizing the geometry of this complex (ωB97Xd/Def2-TZVPPD). Slowly, the He started to creep out of the centre of the complex and emerge from the cavity. After about 100 steps it reached the geometry shown below, at which point the Wiberg bond index has dropped to 0.62 and still going down. I think it might take a few more steps to be completely expelled, but I have stopped the geometry optimisation at this stage. 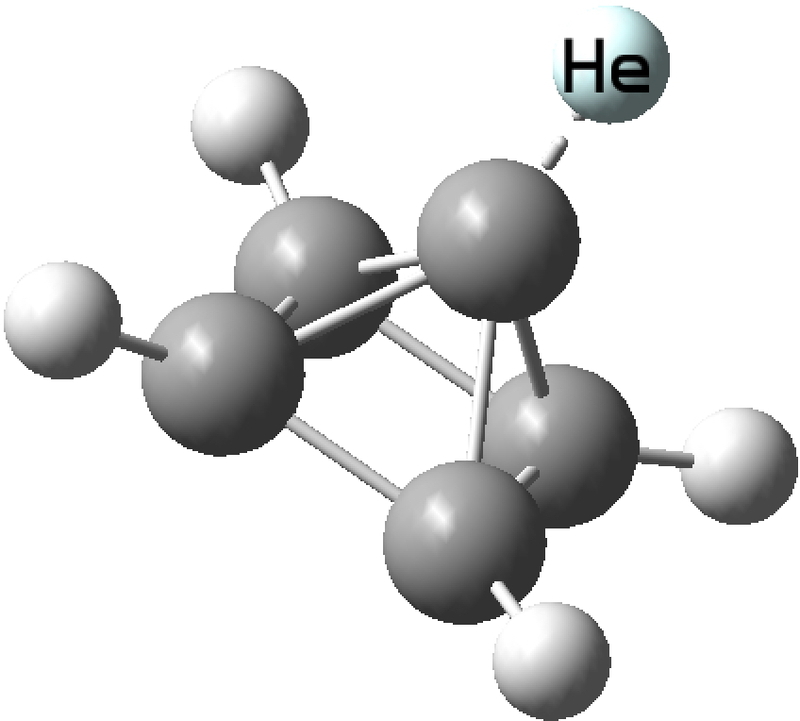 So helium appears not to be valent in [HeCo6(CO)15]. However, I have yet to try Ne, which is both larger and softer. I will post results here. This entry was posted on Friday, February 16th, 2018 at 8:41 am and is filed under Hypervalency. You can follow any responses to this entry through the RSS 2.0 feed. You can leave a response, or trackback from your own site. Can you also post the initial geometry for which the bond index was 0.71? Did you check also the delocalization of the QTAIM? If a small atom like helium can not stay in the “void” then why expecting something larger to stay in? Re 2nd question. Ne is softer, with larger overlaps to the adjacent carbon. Thus the small hard carbon rattles between two Cl atoms to become a transition state at the centre (the SN2 reaction), whereas the larger Si fits nicely at the centre and becomes a (5-coordinate) intermediate. Sorry, I didn’t notice the data files. By the way, in the log file the total He atom wiberg index is 0.6187 not 0.71. Maybe I am missing something. By the way, dismissing this minor difference, I think using a simplified index at a non-equilibrium geometry is not a safe way to deduce meaningful results. As I stressed, more sophisticated indices must be used to be sure that this number is not artificial. The bond index is 0.71 at the geometry of the hydride complex, as noted above. As the geometry optimisation proceeds, the He gradually starts to leave the centre of the complex. After a number of steps, the bond index started to drop quite quickly, having reached 0.6187 at the point where the geometry was archived. I did not continue this optimisation, but no doubt when the He has fully left it will have dropped to zero. I did not apply more sophisticated methods, since the species is not actually a stable minimum. Hypervalent Helium – not! is licensed by Henry Rzepa under a Creative Commons Attribution-Noncommercial-Share Alike 3.0 United States License.